So, five years ago, after I had completely stopped designing jewelry, we moved into temporary housing, preparatory to selling our house. I dumped all of my jewelry making equipment into boxes, (mostly) carefully labeled everything - and we moved. I was exhausted from taking care of the SO's diabetes management (he had been diagnosed a couple years earlier) which required me to get up several times a night (actually it still does - it's either me or him, and I'd rather he get as much sleep as possible at his age). I spent the next few years directing my creative energies into whatever the SO was doing. And all of the jewelry-making equipment sat in the corner in boxes, until we sold our old house and bought the one in which we are currently living. I stored all of the jewelry boxes back behind the bar in our basement that some previous owner had installed (nothing like having a keg tap in your basement for all of those wild parties you're not having). And it all just sat there. In the meantime, I stopped visiting bead blogs, bead stores, bead shows, anything that might have prompted me to spend money on something I was no longer working on. I had a couple false starts (right here on this blog), but I think I'm finally ready. I've started opening the boxes. I found several sealed packets of Art Clay Silver 650 (which it seems the company no longer makes??) that are, oh, 6 years old at this point. (I found an old receipt: $73 for 50g!) I have squeezed the packets, and I think I have a 50% shot of the clay still being viable out of the packet. We shall see. I have not tested the kiln yet - hopefully, it's still working. We shall see, we shall see. The photograph above is of an element I made probably around 2012. I had this idea - a good idea, I think - of designing a piece around the Tempest, a celestial and downright ethereal piece. I made this, and - it wasn't quite right. So I set it aside. It's really not all that bad, but it's also not really what I was aiming for. The thing is, I had a flash of insight yesterday, and I think I've finally figured out what to do. I got out a new sketchbook. I may have cut and pasted various shapes from index cards last night. I also started trying to re-discover the blogs/Instagram accounts of creative people who have been doing gorgeously creative things in the past 8 years I've been living under my rock (having so much material to look through is like wading through treasure - it's compulsively readable). There are many people whose work I'm still trying to find again. I'm looking forward to finding them. I don't know if anyone out there still has their eye on this blog or not, but I wanted to at least stop by. I'm not sure at this point how often I'll be posting here. I've decided to try an Instagram account. You can find me at melissa_strandsofbeads if you are interested. By the way, that beautiful bead within a bead in the photo is by Carter Seibels. If I recall correctly, she mailed it to me after I won a contest she was holding to name one of her pieces ("Geometric Safari"). The more I look at that element, the more I think I should go ahead and design a necklace around it. Carter's bead is seriously too lovely to waste. Since the end of the school year is approaching, the SO has started to bring home all of his artwork. He handed this to me today. 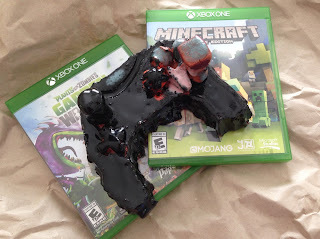 Apparently, the art teacher told his class that they should use the clay to make something they like, something that represents them. Note the super-duper special big button on the right in blue. He calls it "XBox Controller." I call it "My Son Plays Too Many Video Games." Incidentally, he didn't score that big blue button when he added it to the piece and it popped off in the kiln (I just propped it back on for the photo.) Does anyone have any suggestions on how best to glue it back in place (if anyone is still reading this after so many years of dormancy and, y'know, non-jewelry-making)?!? Your input would be greatly appreciated! Here's my little shrine to Tarina Tarantino x Kidrobot. Back in 2008, we visited the Kidrobot store in Soho (which, alas, has since closed) - I think the little Zoomies figures in the photo, which I borrowed from my son, come from that visit. 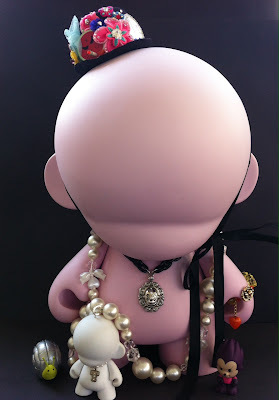 I remember seeing fabulous quirky and colorful Kidrobot jewelry in the display case, but I had no idea who Tarina Tarantino was back then. I thought about that jewelry for YEARS after. Actually, I'm still looking for that cute Zoomies necklace that was on display at the time. 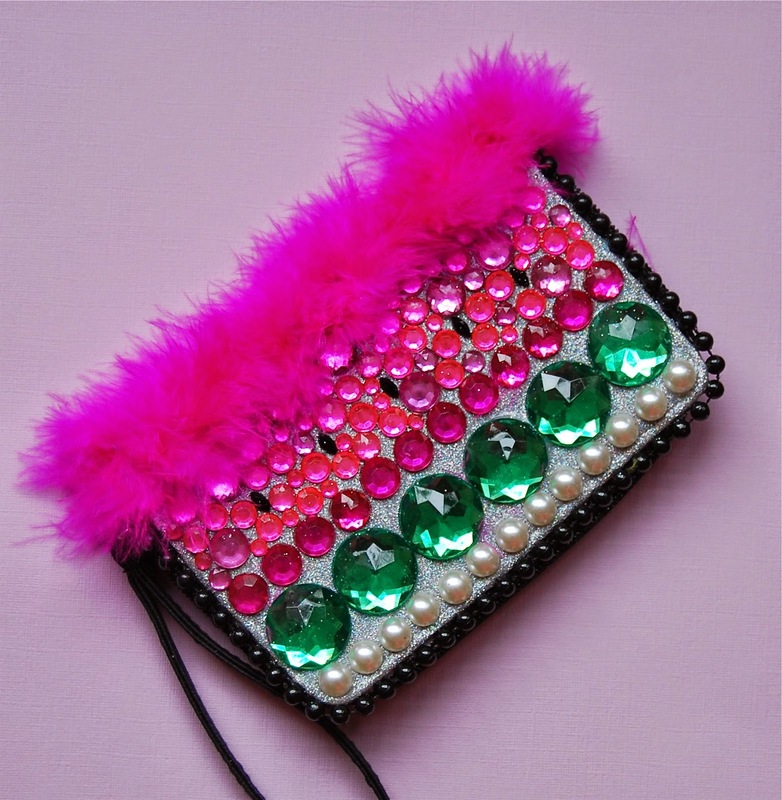 Continuing on with my Mardi Gras throw-inspired crafting, here's a glittery wristlet purse. The Mystic Krewe of Nyx throws hand-decorated purses during their parade, so I thought I'd try my hand at making a few to give out to friends. Hail, Nyx! 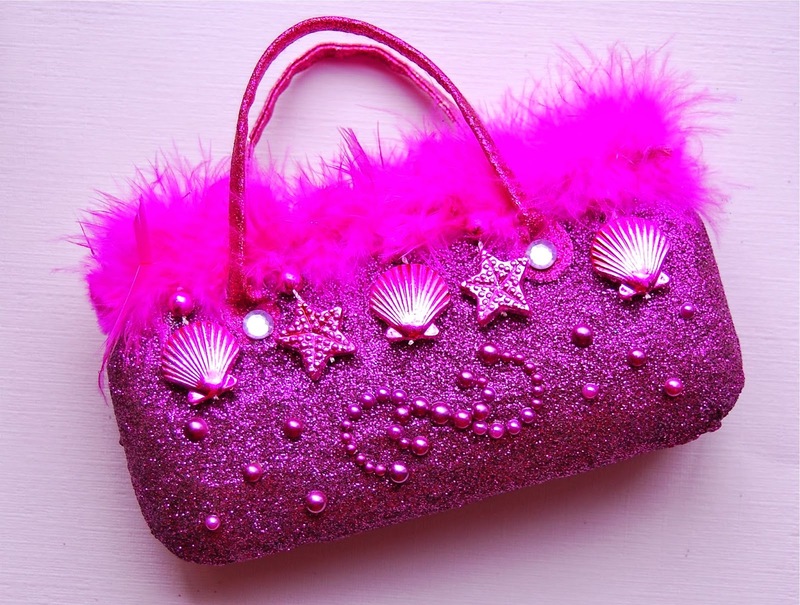 This is actually the third purse I've glittered, but it's the first that has that over-the-top feeling I'm striving for. Anyone who has followed my jewelry in the past knows I'm all about the theme, and I really like being able to go to town with the shoes and purses in that regard. And the color! That's the one thing I always struggled with when working with the PMC - sometimes there just wasn't enough eye-popping color for my tastes, regardless of what I added to the fine silver. That's no problem with these projects! Anyway, this was my first attempt to use the transfer technique that Nori discussed in her wonderful blog, Confessions of a Glitter Addict. I did the lettering separately using fabric paint and glitter and then applied it to the bag with E6000. This worked wonderfully, and allowed me to use the best combination of letters out of three tries. 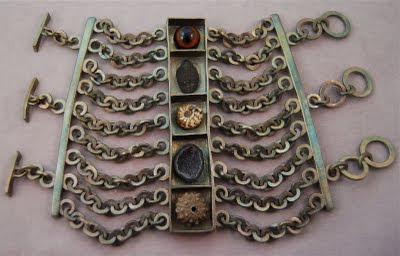 I'm eager to try more complex designs (and the cogs have started turning about applying this technique to jewelry-making...). I hand-set those flat-back pearls with tweezers - it was a little annoying. The simple "S" design is supposed to suggest a wave. The dangly shells and starfish are a cut-up necklace, also from OTC. These are from a dozen I bought for a summer Pirate Party for the SO but never got around to actually using (although the SO did get his party). I suppose the whole watermelon-rhinestone pattern is a little overdone, but I hoped framing it in black on a silver glitter background and using the oversized rhinestones would make the design pop more and add some interest. I had left over marabou from the first purse and found the color complementary here. So, I'm still obsessing about Mardi Gras. It's become pretty clear to me though, while learning about the celebration, that I'm much more interested in the crafting and riding aspect of Carnival! While the waiting list for Nyx is closed, they did have a submission form open on their website last month, and I put my name in. I noticed the other day that the form isn't there anymore. I have no idea what that means, but I'm crossing my fingers and hope to be contacted sometime in the future! Hello, anyone out there?!? I have no idea if anyone is still reading this blog after my continuing, years-long hiatus, but I've recently been inspired, so I thought I'd at least go ahead and post. I have no idea why, but after ignoring Mardi Gras for the better part of my life, I suddenly decided this year that it would be fun to celebrate and introduce the Short One (who, after a couple of years, is no longer all that short) in a modest way to Carnival. Naturally, I decided this about a week before the day, but thanks to some very efficient sellers, I had just enough time to order some beads and a lot of old doubloons off of eBay. I also picked up a King Cake locally. The SO was all "They put a baby in the cake?? Why do they put a baby in there? That's kinda gross, Mom!! No way; I don't want the baby!" After thinking about it, though, I think he decided he wouldn't mind to be king for a day - as my husband would say, "And how is this different from any other day in our house?!" Just by sheer luck he did get the baby, and he was (secretly) very pleased about it - the baby is currently residing with his well-loved doubloons and beads. So, the SO enjoyed our little celebration and moved on to other things, the way you do, but I started learning more and more about New Orleans (which I have never had the good fortune to visit) and the history of Mardi Gras. I got interested in the krewes, especially the all-female ones, like the Krewe of Muses. For anyone reading this who doesn't already know, during the Muses' parade, they give out highly coveted, highly glittered, hand-decorated shoes as their signature Mardi Gras throw. 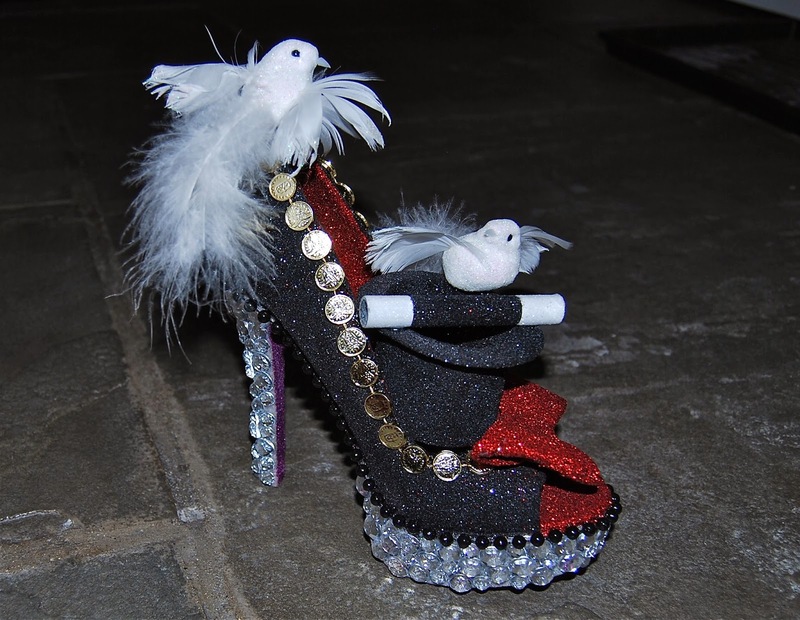 The designs can be over-the-top wonderful, and I have rapidly become obsessed with these iconic shoes. After reading Muses' member Nori's wonderful blog, Confessions of a Glitter Addict, I became increasingly inspired. My design book, which is still languishing with many unfinished jewelry designs, has been filling up again. I decided to try creating a few shoes of my own. Here's my first attempt. Honestly, I'm not sure if it's done yet - I'm thinking of putting "ABRACADABRA" lettering down the side. Also, I really wanted a white rabbit popping out of the hat, but the only one I found that was the right size was a cute plush finger puppet - the plush just didn't look right with the glitter (in my opinion, anyway). So, anyway, I used the doves instead, but if I could find the right rabbit, I'd totally try this idea again. As with any first try, I learned quite a bit making this. First, yeah, the glitter really does get everywhere, just as every Muse whose blog or interview I read said (fancy that). I tried as hard as I could but the extra fine glitter, while it looks beautiful when applied, is very hard to contain. It was all I could do to keep it from being an ingredient in dinner. 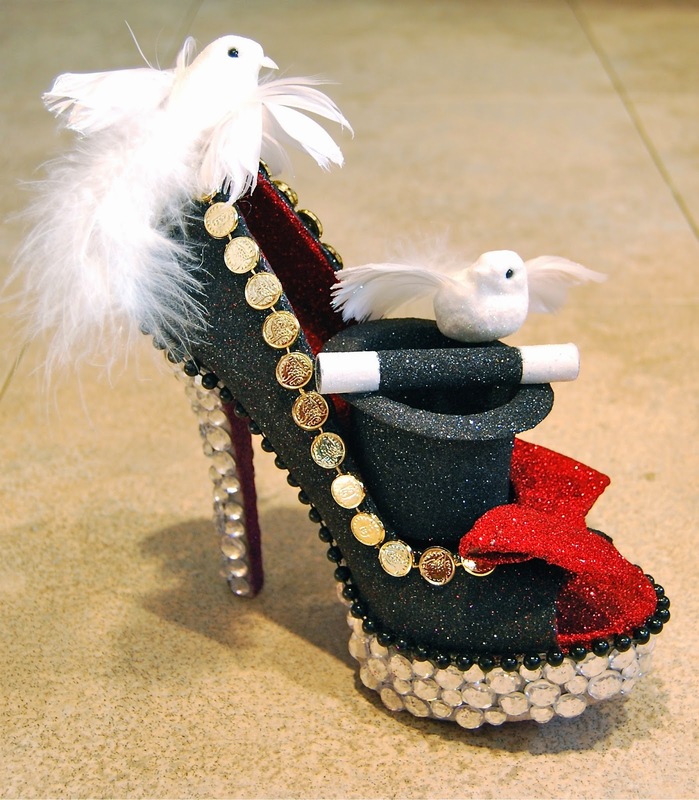 Second, you really do need to paint the shoe white before starting, if you plan on using a lighter shade of glitter. It's probably difficult to tell from the photos, but there's white glitter under the rhinestones. The original shoe (I'll have to post a photo of it later) had a silver and black snakeskin pattern on the heel - it took me 5 coats of white glitter to obtain even moderate opacity over that pattern. Third, I found it extremely difficult not to cross-contaminate the glitter when applying each new color. There was always a little glitter loss after one layer dried, so my white, for example, has just a tiny bit of red in it. I haven't figured out how to avoid this. I used Aqua Net (recommended in Confessions of a Glitter Addict) to seal the shoe but didn't apply it until all of the glitter was on the shoe. Perhaps applying it after every layer would help? I haven't had so much fun on a project in a long time. I already have my second and third shoes lined up with sketches for three more developing. And I'm making purses à la Mystic Krewe of Nyx as well - although I've had a harder time finding inexpensive suitable purses. It's definitely on my bucket list now to ride with one of these wonderfully creative krewes once in my lifetime! In the meantime, thank you to the Muses for the inspiration. Here's the first piece of jewelry I've made in over a year. (My son really loves LEGO, can you tell?) It's a neck cuff assembled from my son's stash - a completely temporary affair, but it was fun to construct. Hope all is well with everyone. I went to Target this morning for sundries and discovered that the store has marked down all Easter supplies to 90% off original price. The section was mostly picked through, but they had a ton of plastic Easter eggs left for a whopping $.09 per bag. Hmmm, I thought, Martian figures? (one of the bags had a nice selection of eggs in greens and blues) Caterpillars? I picked up a bunch and put on my thinking cap when I got home. I've decided they'll make great kids' maracas for cinco de mayo. I obtained the go-ahead from the SO's teachers at lunchtime and mocked this up. Cute, eh? I made the design with Sharpie markers on a white plastic egg. 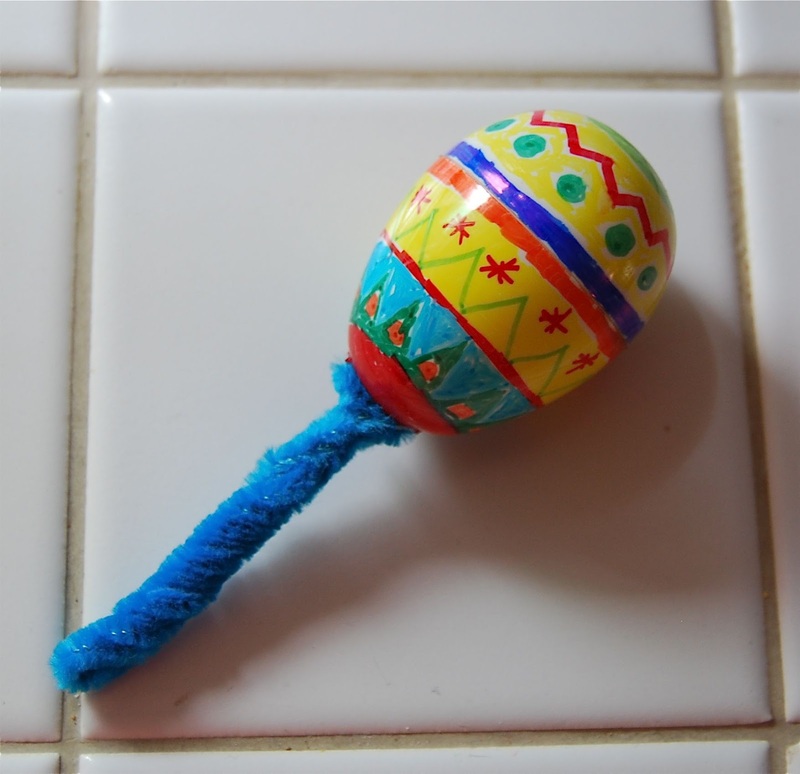 These eggs conveniently have 2 holes on either end, so I simply threaded 2 long pipe cleaners through the holes and then folded them (so the pipe cleaners are in quarters), twisted them, then secured the join with hot glue. Add a spoonful of rice and beans (and maybe hot glue the egg closed to avoid accidents), and you have a simple schoolroom craft. I think the kids will go for it - what do you think? 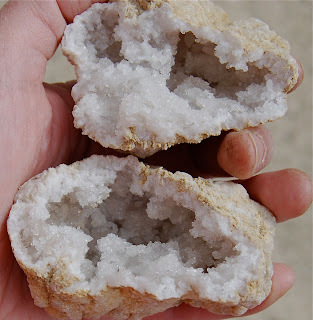 I finally decided that hauling the SO out to collect geodes in a riverbed was not realistic, at least for the next year or two given his age, so I gave in and we picked out one at the local rock shop to crack open. The helpful advice we received there: "The bigger they are, the lighter they are, the better they are." We found a nice light US (as opposed to Moroccan) geode - and sure enough it was full of dense but delicate quartz crystals. My husband used a chisel and hammer to open this - I can see we will need a little practice to open these more cleanly, but I think it's not a bad first try. The SO enjoyed the results (and now has something for his next Show-and-Share day at school). 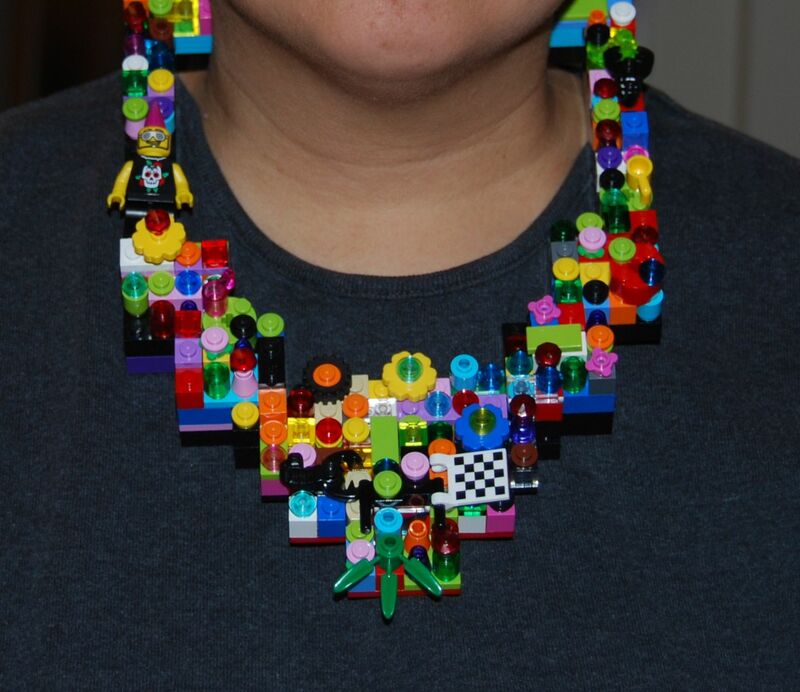 I'd like to say I've been working like mad on jewelry behind the scenes, but this would be a complete lie. On the other hand, I finally spent part of my prize money from last year's Fire Mountain Gems and Beads contest yesterday - I can hardly believe I've had that $750 gift certificate just burning a hole in my pocket for the past 8 months! (Thanks again to Fire Mountain Gems and Beads and sorry I was a weenie and missed the contest deadline this year.) When my treasure arrives (and I mean it - I picked up a big strand of graduated sapphire rondelles among other things), I'm hoping it will inspire me to start working again. Hope you all are doing well and Happy New Year. I've produced so few new pieces in the past couple years, it gives me a great deal of pleasure to be able to reveal, finally, one of my favorites - my bracelet entitled "Evolution". Fire Mountain Gems and Beads has just announced the winners of its 2011 Metal Clay, Metal Beads, Wirework or Chain Jewelry-Making Contest. I am so pleased to report that my bracelet has taken the Grand Prize Silver Medal in this contest. As always, the chain and box were all handmade by me using silver metal clay. In this piece, I've included a beautiful fossilized urchin, polished half geode, fossilized polished trilobite, fossilized ammonite and a vintage glass taxidermist eye. The bracelet has been weighted so that the focal will sit properly on the wrist. My in-laws were visiting, and they took the SO (and me) to the Museum of Science and Industry. 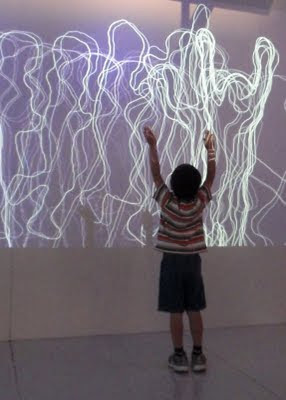 Ironically, he wanted to spend most of his time there in the 727 they have as a walk through exhibit on the top floor - this is the same child we can barely get to sit still for a two hour flight... Of course, he did have some fun with this exhibit - the outlines were all generated by his bouncing around in front of a projector. Life is good, but I'm still not making any jewelry! Hope all is well with you. Who Does Mattel Think It Is? Arrow's helper. And can you please make a Miss Martian Toy. Actually, here's the whole letter, if you have any interest in reading it. 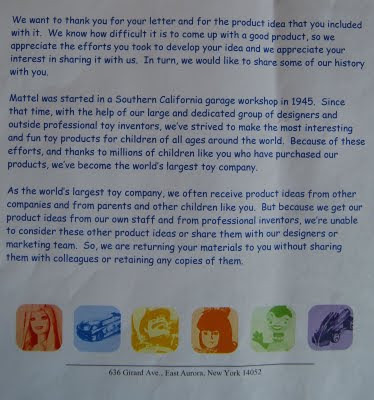 Now, I am an intellectual property lawyer with a decade of experience, so I know exactly who wrote this letter - especially the paragraph I highlighted above - and why. 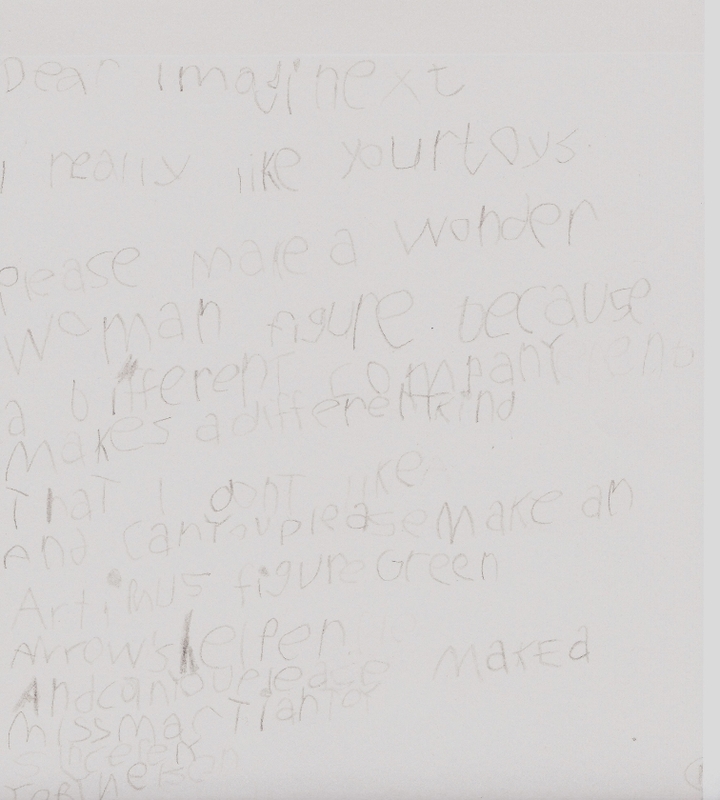 What I would like to know is whose good judgment decided this rights letter would be a necessary thing to write to a child who is not yet in kindergarten (and, yes, the letter was addressed to him)? Intellectual property rights? Royalties? Licensing? He just wanted a new toy. We appreciate your timely response. Based on said response, it is clear that you need better legal counsel and more common sense. 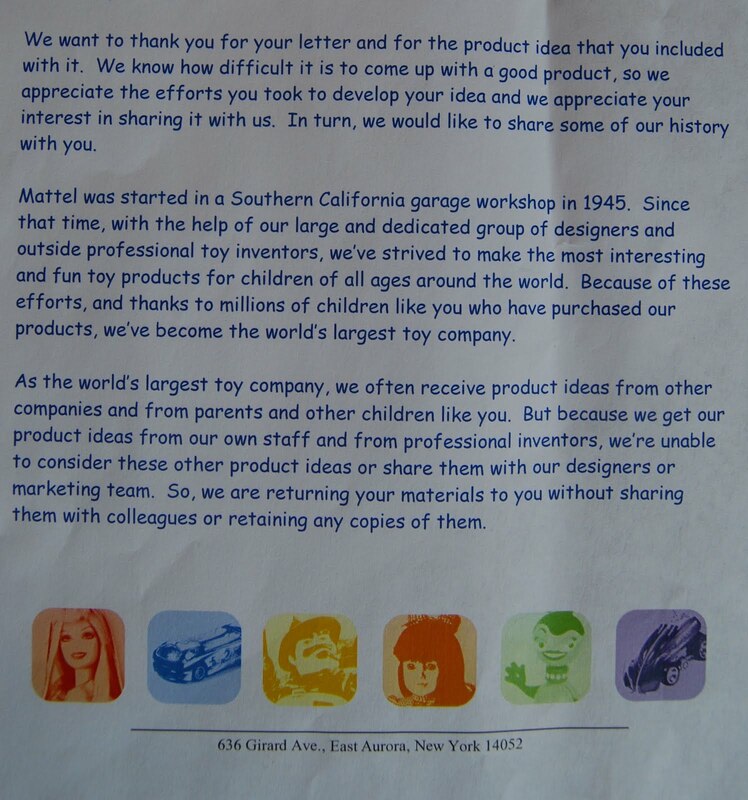 The complimentary Mattel magnet with the slogan "Inspring Kids' Imaginations" enclosed in my son's original envelope that you returned to us was quite a surprise. You have certainly stimulated our creativity and imagination while we consider how best to use this gift. Thank you so much for destroying my child's dreams. 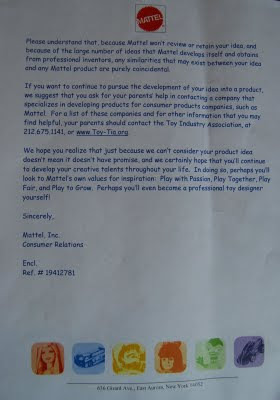 We can tell you must be the world's largest toy company simply by the level of sensitivity with which you handled this request. This week Carmi has a short tutorial on using resin as a glaze. Andrew takes a peek at Anne Choi's new BRONZE beads! Rio Grande is encouraging a wonderful way of helping the people of Japan and it is SO EASY! Read about it on Jean's blog! Do you like glitter AND jewelry making?! 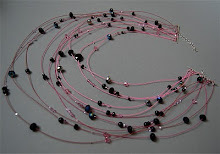 You are going to love this project that Lisa found over at FusionBeads.com! We all scream for Ice Cream! 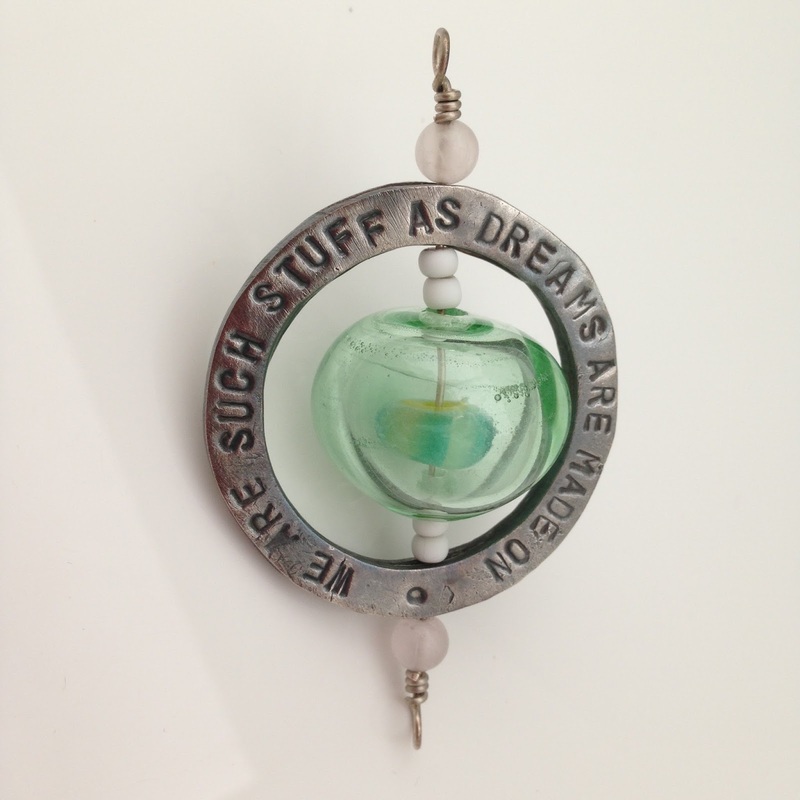 Melanie shows how she designed and made a new line of sweet pendants. What are your plans for your siver scraps now that silver is crazy expensive? Cindy's made some new blush pink drops, come see what she's done with them! This weeks blog features the poppies of Paris and the jewelery it inspires. Barbe's giving away the latest Industrial Chic booklet and some charms! 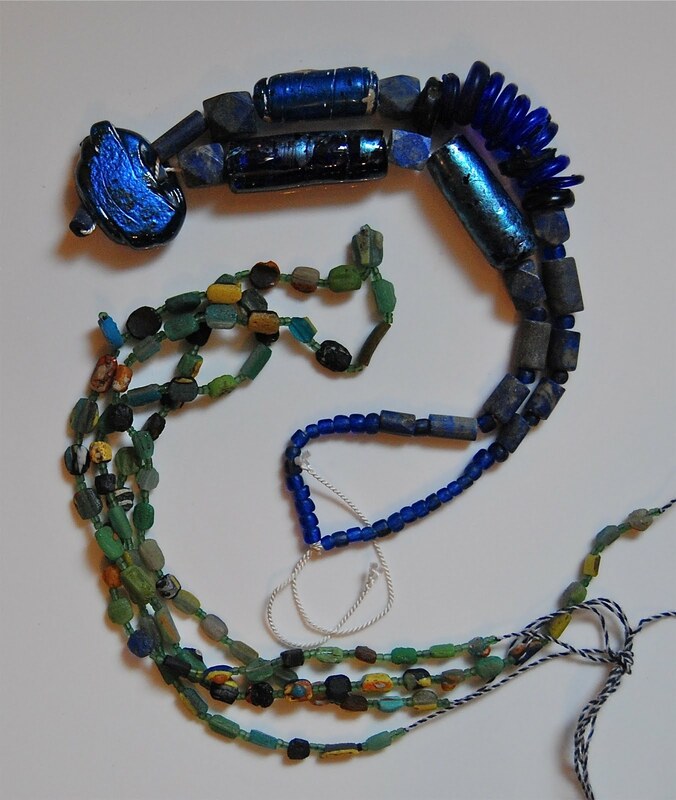 As part of the Artbead challenge, "What's Old is New Again", Cyndi has constructed a flapper-style necklace from some very cool components! A lovely tree branch, soft pink flowers and wisps of silk inspired two necklace designs. Melissa is brooding about issues of originality this week. 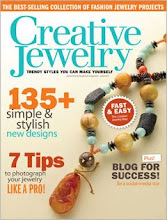 I just received my author copy of the magazine in the mail today - it was a fun trip down memory lane. 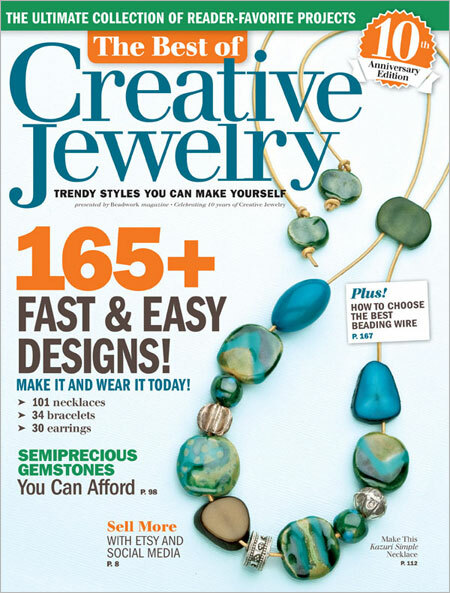 The bulk of the projects I wrote for Creative Jewelry are reproduced here, as are many of my favorites by friends and colleagues (one of my absolute favorite designs by Lorelei Eurto, "The Kiss", is on page 61). It's on the stands now, so please check it out when you have the chance! 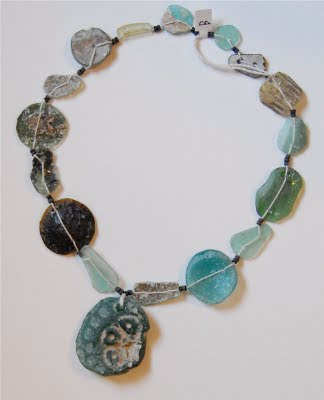 My local bead store, Chelsea's Beads, has just brought in a really nice shipment of Roman glass beads. (I took a look, and some of them are available on-line. In fact - hey! - I didn't even see those cute fish shaped beads when I was in the store.) It's difficult to tell from the above photo, but these beads are actually pretty big - the focal pendant is about 2" in diameter. 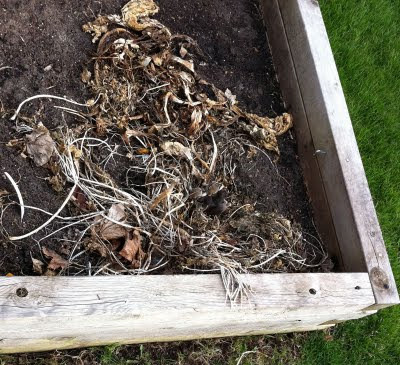 Look under the " Large Circle" section on-line for similar-sized strands. Ack - since I first drafted this, they've already sold out! On the plus side, the barrel shaped beads are now 50% off, so you may want to check them out (soon!). 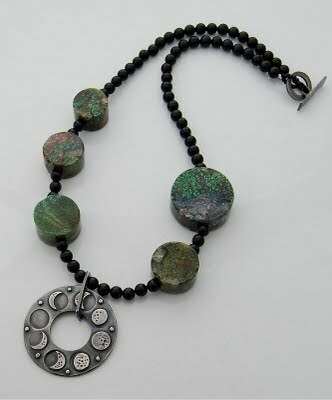 Perfect Bronze Bead by Anne Choi. Last year, I had this great idea to expand my "Love is a Puzzle" series of pendants - a big rebus with "Eye Love You". I have been cackling with glee over this one - I thought it was a really original, graphically appealing design. In fact, I was just getting ready to sketch it out and make it for a contest later this year, when I checked out Anne Choi's newsletter this morning and found the above bead - a design I am sure has been in her stable of beads for ages. This is an object lesson to me to do my homework. I've had this happen once before. Several years ago, I was working on a metal clay window design. 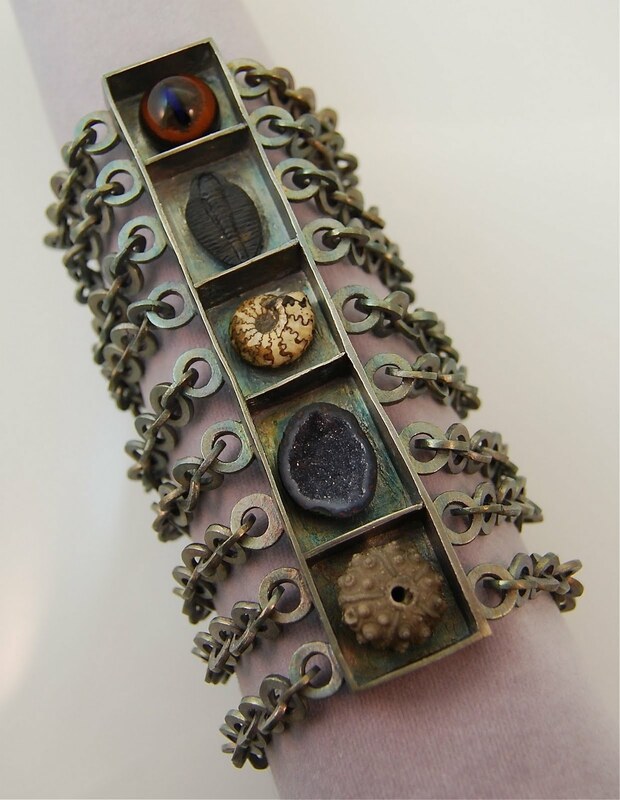 I was still in the sketching process when I came across Noel Yovovich's fabulous bracelet (you can see a photo of it on her blog, here). I got depressed and shelved the piece. 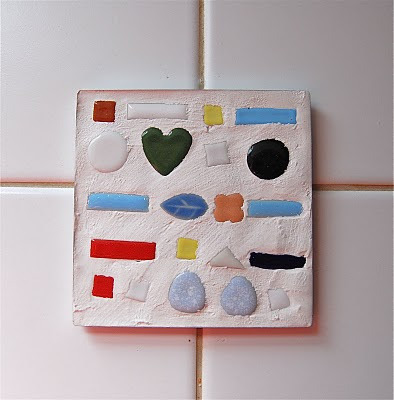 Of course, many people have been playing with window design beads since then, and I have since come up with an original twist on it (knock on wood), so it is actually back on my list of things to do - but it's taken a few years in between to reconsider the design. This one I think I'm going to have to scrap altogether, though. The originality is in the rebus itself, and I think Anne's bead is beautiful. Has anyone else had this experience? Because, you know, misery loves company, and I am feeling seriously disappointed right now! 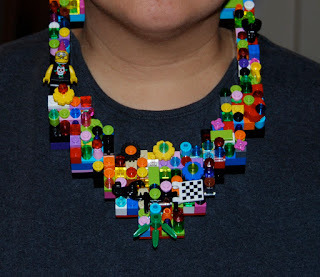 Pets and children are wonderful, but they can make jewelry making very challenging! Andrew debuts his new filigree bezels filled with vintage stamps coated in resin. Check them out! 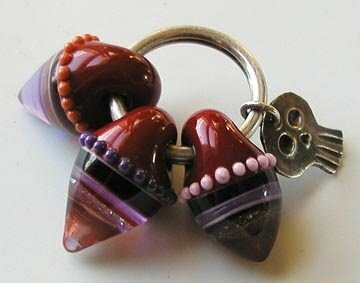 The Art Bead Scene shows off this month's challenge. Come take a look! 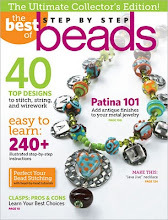 Are you a crafter AND a beader? Do you ever give in to mixing craft supplies into jewelry pieces? Stop by A Bead A Day to see Lisa's latest arts and crafts jewelry. Cindy shares one of her free projects. Melanie introduces a new egg themed design and wonders what the Earthenwood Design Team will hatch up in jewelry designs. Melissa is back and is wondering if anyone else has trouble using materials that are "too special" in their projects? 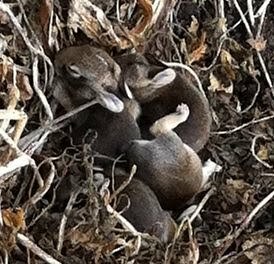 Yes, it seems the mommy bunny that lives in our back yard took the initiative this year and set up her nest actually inside our garden box (right where the tomato and green bean seedlings are slated to be planted in a few weeks). 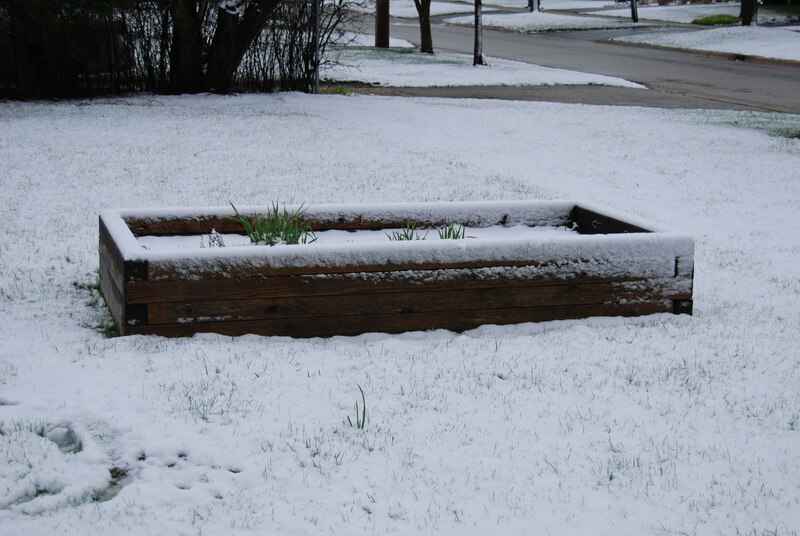 Each year, I watch our local rabbit wander oh-so-nonchalantly up to our garden boxes. Honestly, I can almost hear her whistling while looking in the opposite direction and gradually sidling up to the box in the most innocent manner. So, I just have this picture in my mind of her thinking, "Yes, prime real estate at last - maybe he won't even notice we're here!" Not being the serious gardener in the family, the Short One and I are quite excited by our new neighbors. The Gardener, however, is somewhat tearing his hair out. Based on our extremely careful (ahem) internet research, though, it seems the babies should be leaving the nest in the next couple weeks, so the G. has agreed to wait until then. At which time, I'm sure he'll be seen spraying the box with fox pee (or whatever he thinks will actually keep the local wildlife away this year) - but that, as they say, is another story. So, I've had this "problem" rattling around in the craft closet. 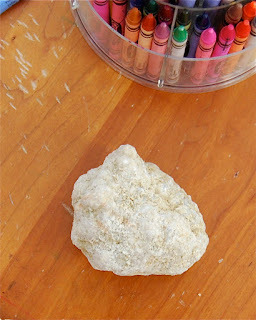 A while ago, when I was relatively new to metal clay and the Short One was more interested in reciting the alphabet than talking our ears off about Marvel superheroes, I toddled off with a 40% off coupon to purchase a packet of PMC3 from a local art supply store. When I went to check out, the nice young lady at the register asked me if I had seen the metal clay that they had marked for clearance. 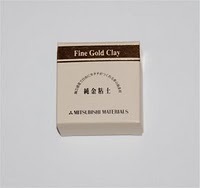 She took me over to the locked cabinet where they kept the clay and handed me the box, above: 10g of fine gold clay, marked down to 50% off. The price? $103.00. Now, this seemed hideously expensive for a small lump of metal clay, but, even then, I knew it was a great price for gold, so I decided to splurge and picked it up. Because I felt like (and was) a neophyte with working with the clay, I set it aside until I felt more technically competent to deal with such a precious material. Every few months after purchasing it, I would take the box out, think hard, and decide that my technical skills still weren't up to snuff for using it. After I finally came off of my seven month hiatus in February and started working with the clay again, I was determined finally to get the gold clay out and use it (before it really gets too hard, and I have no choice but to turn it into paste). Then I checked the current price of precious metals and nearly fainted. 10g of PMC Gold, the 22k version currently on the market is now selling for over $600.00. Gack! As stupid as it is, I may never get the nerve up to use this clay. Which I know would be a complete waste, but I find the whole situation paralyzing. Does anyone else have this problem, like buying particularly nice beads and then never finding a project "good enough" for them? 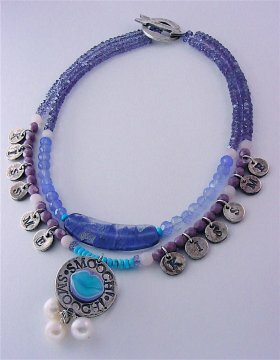 I just finished my Bead Dreams entry yesterday, as usual, running right down to the wire - but I did make the deadline. Barely. Anyway, working on any contest piece means I've been getting out my high end strands for stringing inspiration. I didn't end up using the above in the Bead Dreams piece, but it's such a stunning strand that I thought I'd post a pic on the blog. 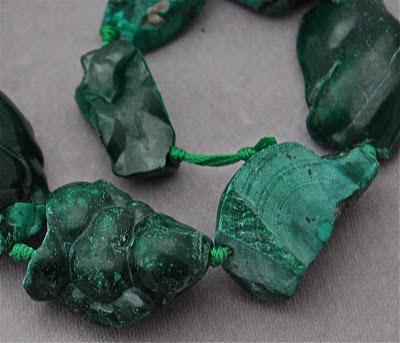 Here's some malachite I picked up last year. Isn't it gorgeous? The more I design, the more attracted I am to the less processed stone beads - raw tourmaline, rough-sliced garnet, and this gorgeous rough cut malachite. Mm-mmm. Here's a little art project the Short One recently completed at school. I have to admit, I like it quite a bit. 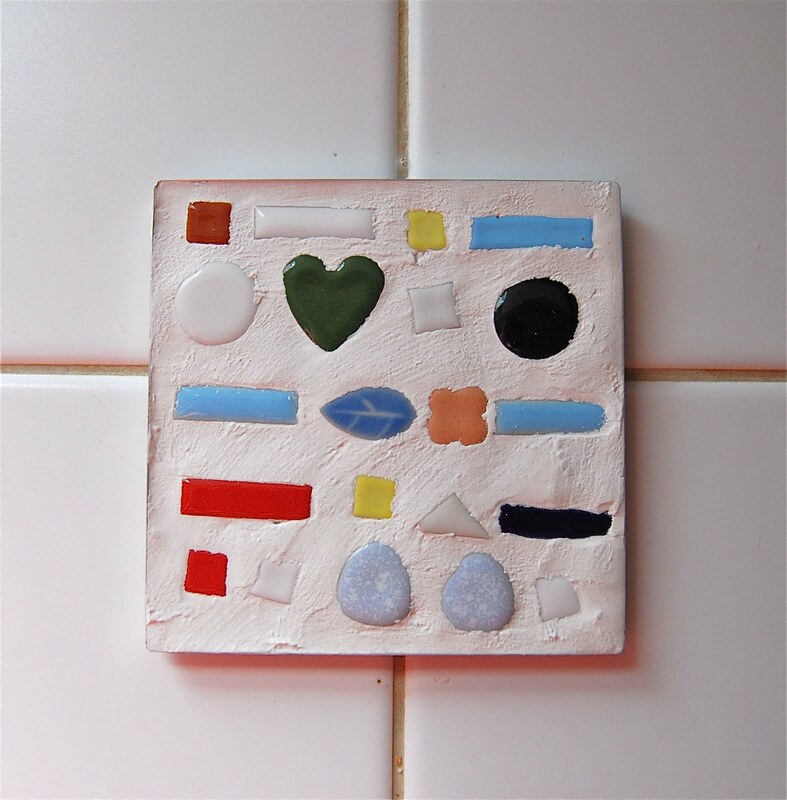 It reminds me of a similar project I made when I was his age (although, times being what they were, mine was an ashtray, not a coaster). But I also really like the colors, the shapes, the spacing. In fact, I think this combination would work very well as a necklace. It's just another reminder to me that most of my inspiration comes from the grubby little muse in my house, the one who's glued too much to his Dad's iPod and enjoys conducting "experiments" (his latest involved sticking gum in his hair and, when it wouldn't come out, taking his safety scissors and cutting it all out - Sandra, the lady who cuts his hair, said that she's seen worse and that it ought to grow out after the next two cuts or so. But I digress...). Seriously, all of my favorite designs were inspired in some way by time I spent with my son. The dragon in the keyhole pendant photographed in my header, above, came to me after we spent time reading books about dragons and dinosaurs. 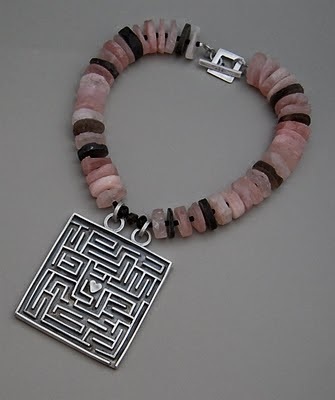 The maze pendant I designed for the 2010 Bead Dreams competition (there's a great photo of the piece on the Bead & Button website, here) was inspired by my son's love of puzzles. 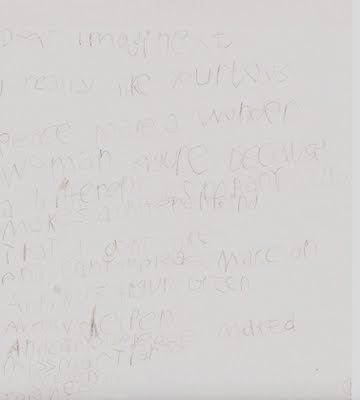 When the SO was a baby, I used to dream of a time when we would be able to make collaborative artwork, but really, there are already little, metaphorical (sticky) fingerprints all over my pieces. So, how about you? Who/what are your muses, grubby or otherwise? 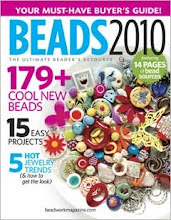 It took me ages to track them down in the U.S., but I did finally manage to get copies of Issues 27 and 28 of Bead Magazine - with full coverage of the 2010 British Bead Awards. With the winners split between the two issues, I had one piece in each magazine. The photography of the winners is really spectacular, and I enjoyed seeing all of the pieces from the various categories. Vanessa Walilka's garment (which she calls a "first scale mail armor piece"), in particular, is incredible - kind of a female-warrior-industrial-age-of-dragons jacket. If you can't find a copy of the magazine, you can see the piece on her website, here - and I strongly encourage you to check it out. 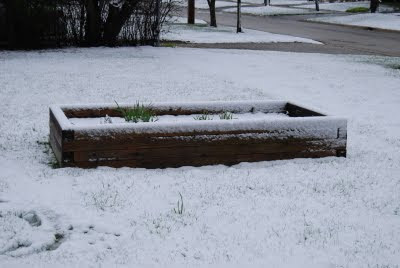 Sarah Moran sent this photo to me ages ago, but, of course, since I haven't exactly been lively on the blog, it got buried. We traded beads a while back, and here's what she did with one of my skully pendants. I can't imagine any silver bead not looking spectacular when strung with Sarah's fantastic lampwork, but I particularly love the way they all look on this heavy sterling ring. Thanks, Sarah! I just thought I'd drop in quickly to say that, yes, I am still here! I've received such wonderful, kind messages from friends and colleagues over the past months. Thank you all - I really appreciate it. All of my time in the real world has been spent taking care of the Short One over the past few months (who is doing very well, I hasten to say). However, as a result, I've just been too tired to keep up with the blog and really haven't created any new jewelry recently (although you should see how crammed with ideas my sketch book is these days). Here's a piece that I created earlier in the year that I thought would be timely to share. Despite the stark color combinations, I think it has a bit of a holiday vibe going. What do you think? 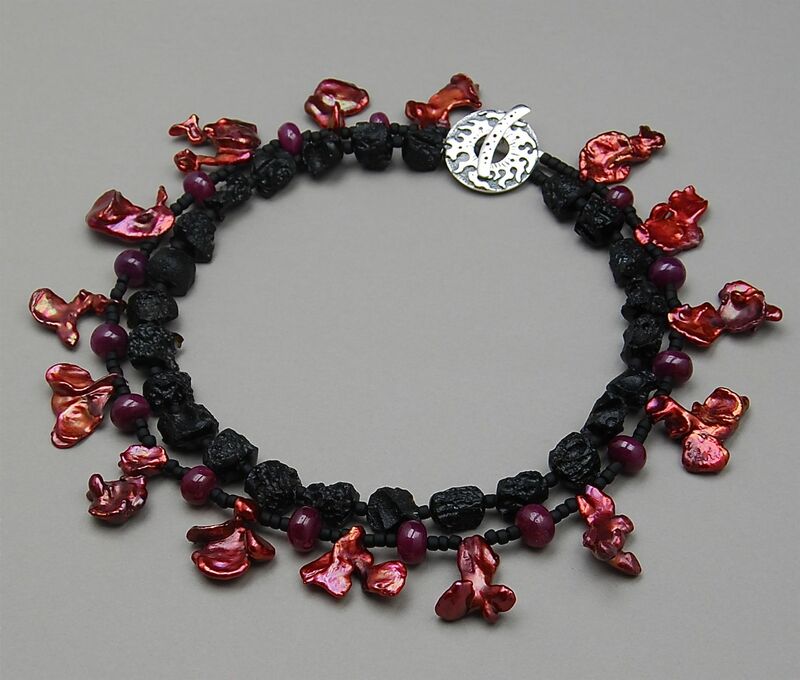 Pearls, rubies and lava rock, all tied neatly together with a beautiful pendant by Saki silver. We're slowly getting ready for our annual celebration, here. This is the first year the SO has been really excited about Christmas. He insisted on handling most of the tree-trimming himself this past Sunday - which, of course, means that 80% of our ornaments are now hanging from the three bottom-most branches of our rather large evergreen. I hope you are doing well, too. Thanks for stopping by! Click on the pic to send me an email. View my project "Jave Jive" here. This is a Flickr badge showing photos in a set called PMC. Make your own badge here. I am an intellectual property lawyer by training and have a background in English Renaissance literature. I love science fiction. I primarily watch Sesame Street these days and find myself humming "Pop Goes the Weasel" at odd moments (guess why). I can happily eat ice cream in the middle of winter when the wind chill is 20 below 0. I have been making beads and designing jewelry since 2007. As indicated in the copyright notice, the contents of this blog are copyright by me. 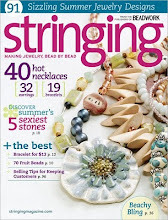 To the extent that instructions to make jewelry, beads, knit items or other instructions are included in this blog, they are free for you to use to make the projects for personal use. They should not be used for commercial purposes, ie, to make items for resale.